Under desk exercise equipment is fast becoming the preferred methods of getting the required amount of daily exercise. There are many types of desk exercise equipment, but one that has proven to be a convenient, affordable, and comfortable solution is an under desk elliptical. 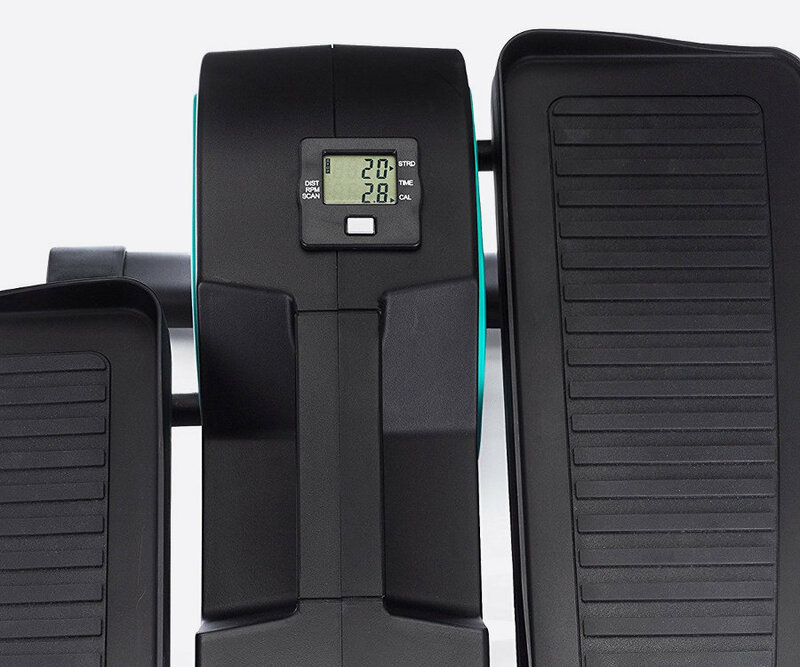 The Cubii Jr and the Cubii Pro are both under desk ellipticals that have hundreds of happy users, so our goal today is to see what makes them such a good choice for your office, what separates them from the competition, and which of the products is right for you. The lives people lead today are much different than they were 20 years ago. Today, technology has made many drastic changes to how people live and what they do each day and it seems that people have less free time than they’ve ever had. There have always been careerists with ambition looking to advance and become better at their work, but today, everyone’s time is limited and people look to achieve results in various aspects of their lives as quickly as possible. With their busy schedules, a lot of people find it hard to tend to their bodily needs and overall health. This is why there is a lot of under desk exercise equipment available that allows busy people to take care of their health while keeping up with their everyday work. Regular people have been looking for creative ways to exercise and their needs have been recognized by various companies offering them exercise tools that they can use even while at their desks, doing their jobs. 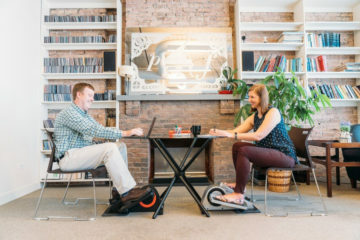 For office exercise, most people tend to use either an under desk cycle, like the DeskCycle peddler, a treadmill desk, or an elliptical like the products manufactured by Cubii. 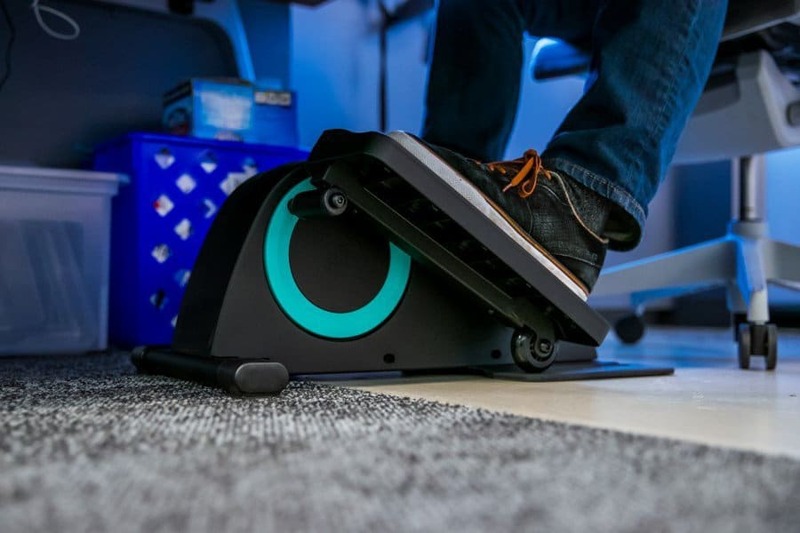 The Cubii Pro and Cubi Jr under desk ellipticals are effective exercise tools designed to help users work out, burn calories and get their exercise without having to stand up. Not only are they designed for office use, they can be used at home and are a great solution for people who have mobility issues. Despite the fact that it’s designed to be used in a sitting position, this under desk elliptical can offer great results and this is why a lot of people have purchased it and use it on a daily basis. 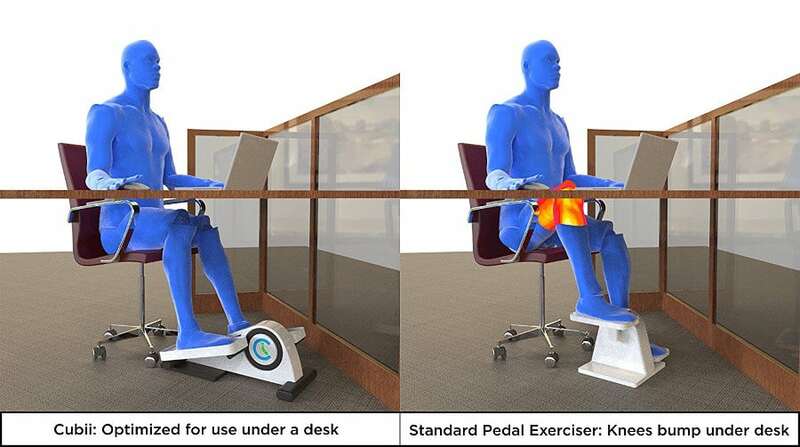 The problem with most under desk ellipticals is the rotation of the pedals lifts too high and you cannot comfortably pedal beneath your desk. The Cubii Pro takes care of this issue with its ergonomic low profile and special design that allows you to comfortably use it while working. It is also a quiet and smooth product, sleek in design, and robust in its build. Overall, we rate this product as one of the best under desk ellipticals on the market. Although Cubii Pro is a very popular and reliable under desk elliptical that offers many benefits compared to other similar products, its price could still present a problem for some people. For people looking to get a small machine that they can casually use while watching TV, working, or while reading newspapers, there is a cheaper alternative called Cubii Jr. This model is designed to be as similar as possible to the Pro model, however, it has fewer features than the Pro which make it cheaper. In terms of reliability, ergonomics, build quality, and the results you can achieve, the Cubii Jr is just as good as the Cubii Pro. The main feature that it lacks is the built-in App support, which is what separates the Pro from almost all other products in this category. The dimensions of Cubii Pro are very ergonomic 23 x 17.5 x 10 inches making it very compact. Its size is similar to the bottom part of any gym elliptical trainers that you can find. This means that it will be able to fit under most tables and desks. It’s designed to make sure that users don’t hit their knees on their desks when working out, however, this will also depend on your desk height, chair height, and your height as well. Cubii Pro weighs around 28 pounds, making it very solid and stable, meaning it won’t move as you use it. Cubii Jr sounds like a smaller unit, but in this case, the junior is, in fact, the same size and still what we consider compact. 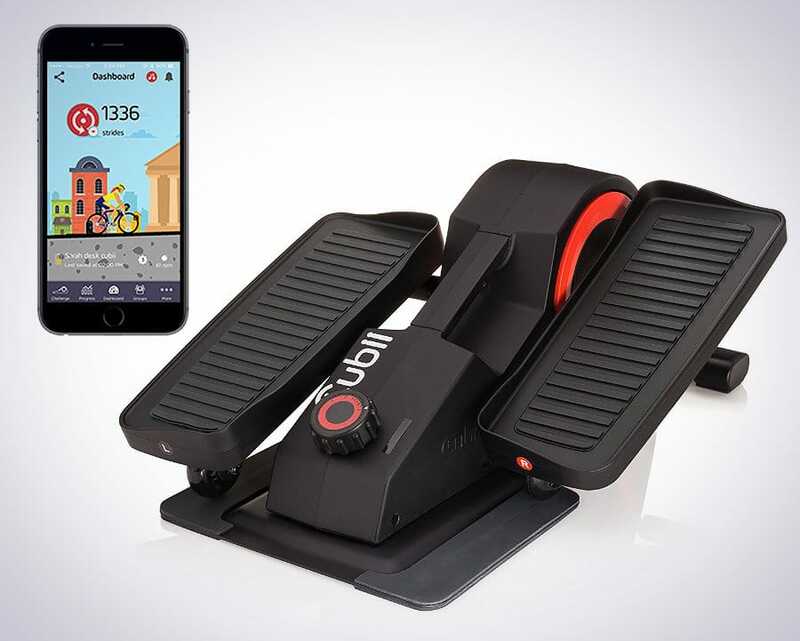 The Cubii Jr is also designed in such a way to keep the pedals and elliptical motion very low. This design prevents users from hitting their knees when using the machine. One of the biggest problems with these kinds of trainers is that they can make a lot of noise when in use. However, no matter what level of resistance you set on Cubii and how fast you cycle, it remains very quiet. This means that you can casually use it in the office or late at night at home when you get back from work without disturbing anyone. Similarly to Cubii Pro, this machine is also whisper quiet. It has low operation noise and the sounds that it does create are non-intrusive. In this department, there are absolutely no differences between the two products. Despite the fact that it’s a bit larger, the quality of the design and the effort put into it remains the same, making it very quiet. Compared to other products that have a similar size as Cubii Jr is certainly one of the most silent machines. Cubii has a reliable, high-quality base designed to provide stable and smooth operation without surprising users with any unexpected pressure. This is the primary reason why it’s a bit heavy. No matter what difficulty of resistance you choose, it never jerks or jolts making it perfect for cycling for long periods of time. Apart from that, this under desk elliptical is designed at a very comfortable angle making exercises feel completely natural. 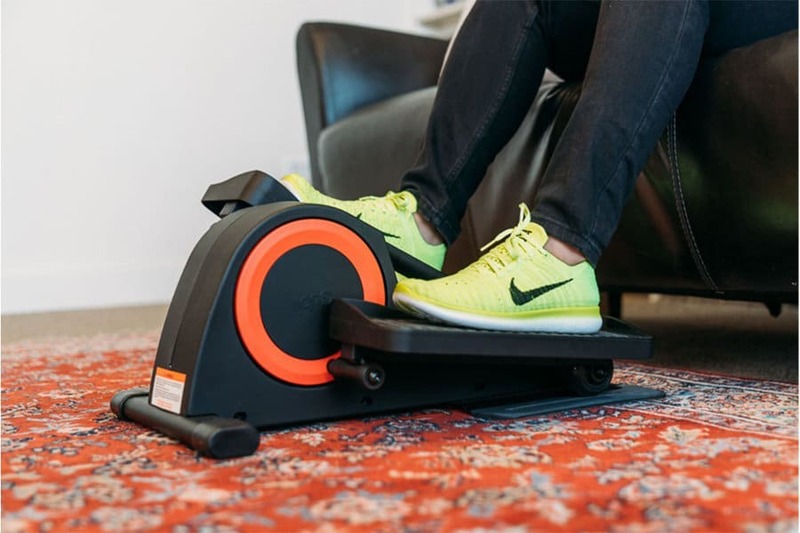 The angle of the elliptical is the same with Cubii Jr as it is with Cubii Pro, making it equally comfortable for working out while sitting down. The performance is pretty much the same and most people can’t even tell the difference between the two when they were testing them out. Cubii Pro comes with a smart functionality. It has a ready app that can be connected to your smartphone device through Bluetooth. The Cubii app is designed for exercising and it measures various important aspects of training, allowing users to get the most out of each exercise and see how they are performing. This app can show various stats including calories burned, time spent working out, distance covered and the speed at which you were going. The app has been developed for both for iOS and Android devices. You can also use it to set goals, connect with friends and share your training performance with others. This is one of the obvious features that Cubii Jr lacks. It doesn’t offer app synchronization. It has the same adjustment dial with 8 different levels of resistance. However, you cannot synchronize this data with the app and see your training performance through your phone. However, the Jr does have a built-in monitor on which you can see your current settings. Cubii has a very sleek and modern design and it comes in two color combinations. One design is Chrome and the other is Noir. It fits perfectly into any kind of office environment. It really looks like any modern gym trainer and you can rest assured that all of your coworkers will be impressed with it. When you look at images of these two models, you will not be able to tell the difference, because there isn’t one. The only difference are the two colors available, that for the Cubii Jr are Aqua and Royal Blue. These colors are bright and beautiful, and we think that you’ll love them! One of the most important things for under desk elliptical trainers is their construction and, with Cubii Pro, the designers put in a lot of effort. Its structured design is the basis for most of its features and the reason why Cubii weighs around 28 pounds is because of the quality materials that have been used to build it. It will not break as some fake ellipticals do, it works smoothly, its parts don’t get damaged easily and it won’t slide away when used. It is specifically designed for seated use, so we do not recommend standing on it to test its durability. Cubii Jr is built from the same high-quality materials and has an identical construction making it equally durable and reliable. Despite the fact that it’s a cheaper solution, it is obvious that the manufacturers invested the same amount of dedication and care into building Cubii Jr. There are no cutbacks in quality or elements within or on top of the machine. 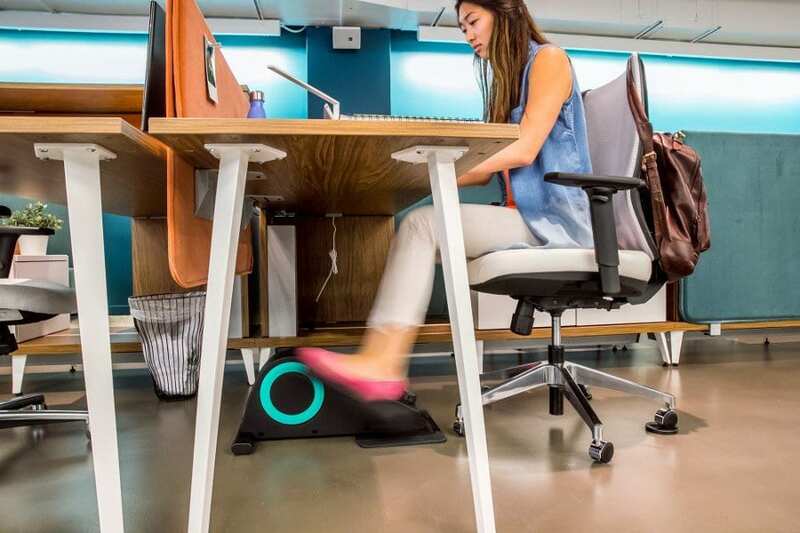 You may also be interested in under desk cycles, which have a similar outcome as an elliptical with a movement that is more like a stationary bike. This machine provides the results and performance everyone should expect from an elliptical. It is convenient, well-built, reliable, and a sturdy machine that can last for a long time. With the app and Bluetooth capability, you can easily track your exercises and make sure that you are getting the results you need. It’s a bit more expensive than Cubii Jr but this functionality can offer more convenience for those that can afford it. The machine needs to be assembled when received and with it comes a simple instruction manual that helps you put it together in 5 minutes. This is a reliable under desk treadmill that everyone would be lucky to have. With all things considered, Cubii Jr is a good investment even though it lacks the Bluetooth functionality and the app which allows you to track your training performance over longer periods of time. Even without these features, Cubii Jr can be used to improve fitness effectively, burn calories and be more active while sitting at your work desk or at home. If you want to track your progress, you will have to put in a bit of effort and manually record statistics on your phone. In our opinion, this is a fair trade-off for the price. Honestly, I cannot see why anyone would need to “Monitor” their progress with this? If both are the same, then it would suffice to say that the cost of the pro is not worth it at all. After all, just using it will strengthen your muscles. Besides that, what “Progress” are you monitoring? Based on what your comparisons are, $100.00 in price difference is ABSOLUTELY not worth it. You are only going to be able to “Pedal” for so long anyway before you are tired and wore out. The “APP” is only something to play with and totally not worth the additional cost. Just my opinion. Hey Paul! Thanks for your comments. What you say is completely true in the sense that, if you are not interested in tracking anything then there is definitely no need to pay the extra $100. I also agree that “progress” is maybe the wrong word here because you won’t be able to monitor strength gains or endurance benefits. That said I do think there are benefits in the App for some people. I think there are many people that like to “track” certain elements of their fitness life, such as the number of steps walked per day, using a Fitbit or Apple Health on the phone. For example, after a few months you could see which days you do more exercise, if you have exercised more this week than last, or maybe you pedal for a time limit and your distance is improving: these are all interesting things to track. It looks too like Cubii have somewhat tried to “gamify” the App experience too so you can compete with others. There are leaderboards and you can post your results, which I believe is a big motivating factor for some people. Anyway, I really appreciate your comments and I’m sure there are many people like you who just need something for a bit of extra exercise while they’re sitting down and in that case, the Cubii Jr is the perfect fit. For those who enjoy tracking distances, seeing their weekly or monthly results, and competing with others, then I think the App can provide that extra bit of fun and motivation. In the end, it is up to the individual to decide if it is worth $100 to them.